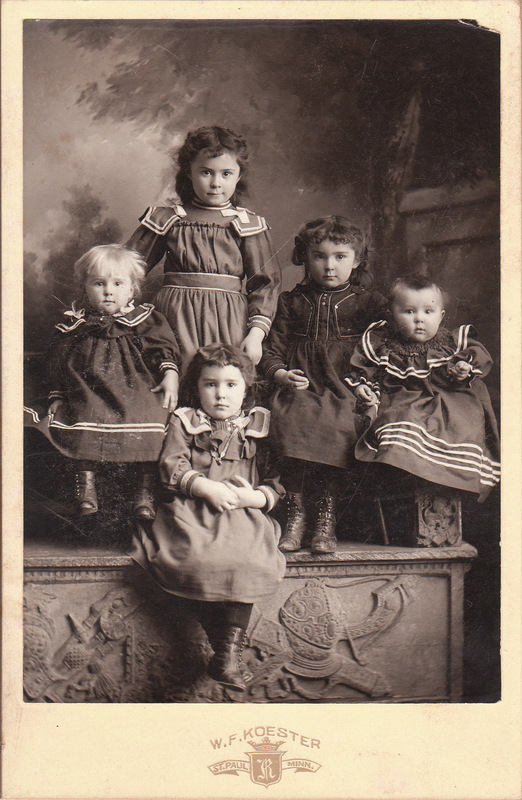 This cabinet card features five adorable children posing together at the studio of W. F. Koester in St. Paul, Minnesota. The children may be siblings, at least three of them have a strong family resemblance. In 1890, photographer, William F. Koester, took a photograph that was fascinating and historic and brought him a great deal of attention. Koester was out photographing “views” from a St. Paul bluff when he fortuitously saw and photographed a tornado approaching the city and touching down on it. The firm of Fredericks & Koester published 5×8 souvenir cards for sale. A local housepainter who aspired to be an oil painter, painted over the photograph, and it became an important work of Minnesota art. A photograph by Fredericks & Koester can be found in the American Museum of Photography (Couple on Toboggan).